Home » Protests in France: when will they end? 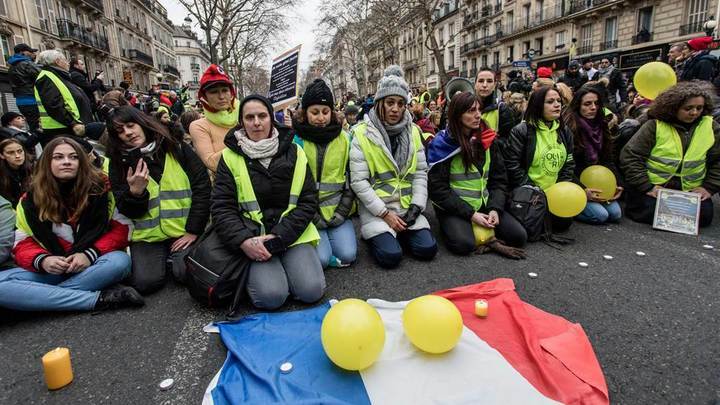 How many people in yellow vests will be ready to take to the streets of Paris and other French cities these days, until the end is not known. But the fact that there will be tens of thousands of them - undoubted. It is also known that the movement of "yellow vests", according to polls, continue to support more than 60% of the population of France. And that means all government measures and establishment gestures of the past two months have been wasted. Christmas holidays did not serve the cause of peace. No one is going to retreat. These days, France is waiting for fundamentally new actions, the effectiveness of which is yet to be tested. The Yellow Vests called on the French to withdraw as much money from their bank accounts as they could. The goal is to cause maximum damage to the banking system as such. Hatred of the Rothschilds who nurtured Macron, as well as all their collaborators, is growing in the country every day. This week, President Macron has appointed nationwide "consultations." On Monday, he will announce the topics of debate in his message to the nation. But it is already clear that the conversation should go about the problems of ecology, democracy, civil society and emigration, as well as the state system. Perhaps, the issue of national referenda, which occupy a special place in the political program "vests", will be discussed. However, outside the discussion there are demands for imposing taxes on super-large fortune (from 1.3 million euros), the prohibition of homosexual marriages and the restoration of the death penalty. For Macron himself, the subject of large capital taxation remains the most painful. This cancellation was part of the election promises of the French president, and he fulfilled this point almost as soon as he came to power, earning himself a reputation as “president of the rich”. Instead of the tax on super profits, property taxation was increased according to a simple and old rule: “It’s easier and painless to pick the poor and middle class”. 77% of the French immediately categorically disagreed with this turn of events. What they thought in the days of the presidential election, in truth, is unknown. However, this is another evidence of how in today's Western systems it is easy to manipulate the selective technologies and stereotypical reactions of the mass consciousness. Two or three spectacular stuffing, three or four compromising evidence, the accuracy of which no one checked, and that’s when the nation voted for its surprise. Sobering and retribution came post factum. In addition to theAn interesting situation emerged with the National Public Debate Commission, headed by Chantal João, former Minister of Sport at Sarkozy. The leaders of the "yellow vests" immediately stated that they would not discuss the problems with a rich lady, only for work in the commission receiving 14,666 euros per month. So who will start negotiations on the part of the authorities is still unknown. This fact alone shows what unrest prevails on the French tops. They clearly do not understand what to do. It turns out that in the arsenal of Macron there is only hope for one thing - a rough suppression of street riots. It is curious that just the other day, the EEC refused to discuss repression against the "yellow vests." So European defenders of rights and freedoms have something to do. clarification of the topics of the negotiations, it is not at all clear how the proposed “consultations” will take place, that is, who and with whom will be consulted. It is unclear even where to start - in city halls, trade unions or in general in social networks. At first, Macron and his government offered to consult local mayors as "the closest representatives of the authorities to the population." However, the mayors hurried to disown this honor. In addition, it is clear that the heads of local administrations representing different political forces cannot guarantee the adoption of certain decisions by the central government, and thus all negotiations will turn into pure fiction. However, Europe is not united. Support for "yellow vests" came from where almost no one expected it. The Minister of Economic Development, Labor and Social Policy of Italy, the leader of the Italian Five Star Movement, Luigi Di Mayo, urged the protesters in France not to give up and declared that his Movement supports all their demands. The head of the Ministry of the Interior of Italy, Deputy Prime Minister Matteo Salvini agreed with his colleague. He stressed that he categorically disagreed with the practice of police brutality. Of course, the performance of "yellow vests" and related problems is an internal matter of France. However, it is difficult not to draw attention to several of the most important circumstances that came to light during these past two-plus months. First, all attempts to explain the events in France by “foreign influence” turned out to be completely groundless. The situation was caused by purely French problems and, most importantly, by the majority of the population being tired of vices and injustice, as well as by the false rhetoric of the system to which traditional political models of Western democracy arrived at the end of the tenth years of the 21st century. People are fed up with elites who do not care about the interests of the population, and, most importantly, transnational financial corporations, which, like a cancer, eats away the body of a nation state. And even more so they are bored with the methods of manipulation. And, secondly, which is also very curious, the protests of the "vests" revealed the extreme rigidity of the French (and, most likely, on the whole Western) laws regarding freedom of manifestation and all such political and legal principles. Since the beginning of the movement, the French authorities have already handed down more than a thousand (!) Court sentences. Armored vehicles were brought to the streets of French cities; not a single street performance can do without the use of tear gas. The authorities want to introduce “bans on hoods” or yellow vests, trying to prohibit the most active protesters from taking part in street rallies by analogy with football hooligans. I wonder how the French authorities are going to implement this measure? Letting people out on the street by ID? And how "banned" will stay at home? And finally, the last. Of course, the upcoming political consultations announced by Macron, the French, European, and domestic liberal media will try to present as another manifestation of their Western "democracy." But this is a pure bluff. In this case, the authorities were forced to make concessions, as has happened more than once in history. We remember how they didn’t want it at the beginning and all ridiculous talks about ecology and electric cars. A few days ago a message flashed that President of France Macron definitely would not come to Davos. The internal political situation requires his presence in Paris. At least one of its goals "vests" have achieved.The state will have to listen with the People.